A massive 8.9 earthquake struck off the coast of Northern Japan causing widespread damage and a tsunami that inundated the city of Sendai. At least 60 people were killed, and the tsunami caused tremendous damage as it swept through the coastline of Northern Japan. 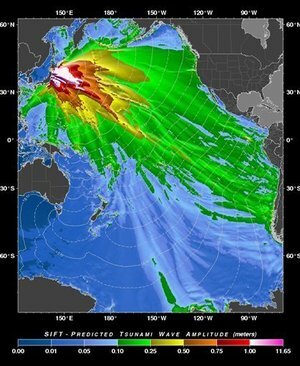 Tsunami warnings blanketed the entire Pacific, as far away as South America, Canada, Alaska and the entire U.S. West Coast. The first waves from the tsunami hit Hawaii at about 8:30 a.m. ET. The magnitude 8.9 offshore quake was followed by at least 20 aftershocks, most of them of more than magnitude 6.0. Dozens of cities and villages along a 1,300-mile stretch of coastline were shaken by violent tremors that reached as far away as Tokyo, hundreds of miles from the epicenter. Police said at least 60 people were killed and 56 were missing. The death toll was likely to continue climbing given the scale of the disaster. Power outages were reported, in part due to the shutdown of several nuclear reactors that were in the region affected - one reported a turbine fire, while another had an issue with its coolant system. Japan ordered thousands of residents near a nuclear power plant to evacuate on Friday following a massive earthquake that caused a problem in the plant's cooling system. Chief Cabinet Secretary Yukio Edano said the Fukushima No. 1 power plant was not leaking radiation. The plant is in Onahama city, about 170 miles (270 kilometers) northeast of Tokyo. Japan's nuclear safety agency ordered more than 2,800 people in the area to evacuate following the government's declaration of a state of emergency at the plant. The quake triggered a power failure and when a backup generator also failed, the cooling system was unable to supply water to cool the reactor. The reactor core remains hot even after a shutdown. The agency said plant workers were scrambling to restore the water supply. There was no prospect for an immediate success. The images and video are startling as cameras trained on the coast and from helicopters overhead captured the tsunami as it roared inland and the strength of the quake surprised even many seasoned Japanese observers and scientists. The quake ranks among the most powerful ever recorded in the world. The tsunami was expected to reach Hawaii around 9am ET, which was 3am local time. Wave heights were expected to be about 6 feet, but local conditions could lead to even higher waves and damage inland and close to shore. 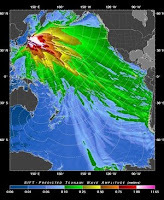 The Pacific rim has braced itself for the arrival of tsunamis and its effects are expect to hit the West Coast of the US in several more hours. Local communities in Oregon are bracing for landfall later this morning. Complicating relief efforts initially will be the fact that the Sendai airport was inundated by the tsunami, rendering it unusable for the time being. President Obama announced that the US is ready to render assistance. The tsunami and quake damage in Japan also may harm the country's fragile economic recovery, and are expected to affect exports and business operations to some degree. Cars ready for shipping were tossed about. Hundreds are reported dead in the quake and the ensuing tsunami and many more are missing. I suspect that the majority of those killed were from the effects of the tsunami. The rigorous Japanese building codes appears to have spared the country the loss of life seen with other massive quakes in recent years. The USGS continues monitoring the situation and lists the ongoing aftershocks from the main quake The list is piling up with significant quakes listed in red. There have been 16 aftershocks registering above 6.0, and the potential remains for further damaging quakes and possible tsunamis resulting from those aftershocks. US airlifts coolant to deal with ongoing emergency at Japanese nuclear reactor. The United States has transported coolant to a Japanese nuclear plant hit by the massive Friday earthquake, Secretary of State Hillary Clinton said. "We just had our Air Force assets in Japan transport some really important coolant to one of the nuclear plants," Clinton said at a meeting of the President's Export Council. "Japan is very reliant on nuclear power and they have very high engineering standards but one of their plants came under a lot of stress with the earthquake and didn't have enough coolant," Clinton said. In addition, the Japanese defense ministry said it had dispatched dozens of troops trained to deal with chemical disaster to the plant in case of a radiation leak. The moves came after Tokyo Electric Power Co (TEPCO) reported that pressure inside No.1 reactor at Fukushima-Daiichi nuke plant is rising, with risk of radiation leak. The crisis at the plant led Japanese authorities to order the evacuation of thousands of residents from the area around the reactor. Officials, however, said there was no sign of leakage at present. More detail on the situation at the nuclear power plants. Four plants shut down as precautions due to the quake, but two had issues with coolant systems, one because of a problem with a backup system that allows coolant to continue flowing even if there's a power disruption. 20% of the Japanese nuclear power generating capacity was shut down due to the quake. That would be pretty unnerving to say the least, although it's a testament to Japanese building codes that the structures withstood the quake and dissipated the energy with swaying rather than collapsing.